We agreed to attend Basil’s home church since it was close to where we lived. The Ivydale Baptist Church has been known for years for having wonderful singers and an excellent choir. It has always been said, “If you are a Hudson…you can sing”. Even the small children knew how to sing on key and harmonize in a group. The singing was a ministry in itself and still is 57 years later. Mr. Basil is from a family of nine kids and most of them lived near the church at that time. Mawmaw Hudson would always have dinner after church and sometimes there were 30 people for Sunday Dinner. 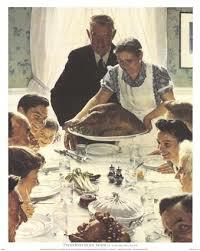 I can still smell the rump roast with dark brown gravy, green beans, mashed potatoes, big garden salad and rolls. The men usually ate at the dining room table and the kids in the kitchen. The women all ate together after the men finished. (Boy has this changed). There was always enough to go around! Mawmaw was famous for using every dish and pan in the kitchen and all us girls had to wash the dishes. She didn’t have an electric dishwasher, but several people with two arms and hands. Washing the dishes would take over an hour, but it was a fun time of laughing and talking about our week. The meal is over and the dishes are washed. It is time to sit on the porch and just socialize. The men are talking about their cars, ballgames and their jobs. The women are talking about the kids, a recipe or a old memory. All the bigger kids are in the yard playing softball and the little ones are playing tag. Sooner or later one of them run’s in crying with a scraped knee. Mawmaw gives the knee a big kiss and it is all better. These were such fun filled and memorable Sunday’s. I would love to experience one more day at mawmaw and pawpaw’s house on Sunday. The journey of a lifetime now begins! Toot the horns and do the drum roll. We were two people doing impromptu as we took on the new roles and wife and husband. Are we supposed to now be grown up and not act 18 and 20? There is still that teen spirit and one that says “settle down”. Can we have both? It is hard to believe that we are now married and have our own life to develop and many roads to travel. I am ready to explore and see what is around the corner. Basil is more of a here and now person and feels faith takes care of everything. Together we will need to blend these outlooks of life. You just never forget your first apartment and will think of it for years to come. You would have loved the laundry room. It was complete with a wonderful Magtag agitator…wringer washer. It was electric. You would separate your dirty clothes into a white pile, dark color pile and towels. Simple. You just put them in the washer turned it on and let the washer agitate for ten minutes. The you lifted them out of the water and ran each piece of clothing through the wringer and dropped them in the basket. The dryer was out on the back porch. He He Ha. The dryer was not electric, but was a clothesline that had been strung between the porch post and a tree. Next week I am going to the laundermat! No kidding. Well, all of my blog fans want the rest of this story. They have been knocking on the door and sending email requesting to hear more. I left you hanging on the cliff, didn’t I. We jumped in that old Ford and headed out for our lifetime journey. If you had friends, they pulled silly tricks on the newly weds and we had lots of friends. The first trick was pulled when we tried to cross the Coal River bridge. One friend got there before we arrived and blocked the end with his car and of course another got behind us and blocked us back off. This little game was played until Mr. McClure, who didn’t know us, started honking his horn and yelling move those cars. We finally arrive at our beautiful little apartment in Dunbar, WV. We were so excited and totally ready to do what newly wed do (got the drift). We go in the front door and here is “our home” and our place to taste freedom, adventure and who knows what. I bought a beautiful white gown at the Diamond Dept. Store for my wedding night. I went to the drawer and got out my gown and someone had sewn up the neck and arms of the gown. Oh, well, I didn’t need it anyway. Eventually, we pull down the bedspread and start to get in the bed, but something seems wrong. Someone had “double-sheeted” the bed. They had pulled the bottom portion of the top sheet up half way and tucked it in. There was no way you feet would go to the bottom of the bed. Who had been in my house?? And………they had sprinkled rice in the bed too. Things are progressing and we hear something rattling and the bed feels unstable. After the other bed problem…we better check this out. The eager groom will take charge of this task. We look under the bed and some of the slats were gone and there was a string of metal items strung up. There were measuring spoons, metal cups and silverware. So, that is what we heard rattling! Someone was trying to be funny, but we could not figure out how anyone got in the apartment. The groom has to go to the bathroom and the tp is missing. This is bad, but we make do. We find the slats and put them back in the bed and it is around 3pm and we are now sleeping sound. It has been a long day and we were tired. All at once, we hear an alarm go off in the apartment. We jump up startled and think the Monsanto plant must be evacuating the town. We keep listening and it is in our kitchen. It is not the stove, but it keeping going off. We listen and it is under the cabinet. Guess what…..someone had put a big alarm clock in a kettle and set it to go off at 3am. Someone, somewhere must be up at 3am laughing right now. I had to report to work at the State House on Monday and I sort of dreaded it. I go in and all my friends are grinning. Mary was really grinning and almost laughing. I told them what happened at the apartment and Mary burst out laughing and admitted to getting the key from the landlord (they were friends) and rigging the apartment. She gave me something to laugh about 47 years later. It is nice to have friends that love you enough to care.